You can buy your copy of the latest Papa Owl book written by Michael Lilley and illustrated by Helen Stiles, whilst taking part in a rocket-making activity at the Youth Zone of the Isle of Wight Literary Festival. This Sunday (21st October), the latest Papa Owl Book will be presented at the Youth Zone of the Isle of Wight Literary Festival at Northwood House in Cowes and will include an exciting rocket making workshop (see below). Local politician, Michael Lilley (IW Councillor for Ryde East) and local artist, Helen Stiles, came together three years ago after both losing family loved-ones. 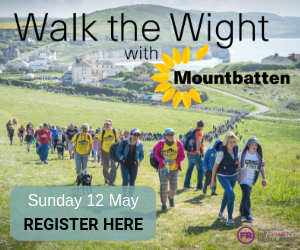 Michael was heavily involved in the Isle of Wight Age Friendly campaign and had written a children’s story around his father as a way of celebrating his life when he died in 2015. The idea was to have a grandfather building and making things with his granddaughters. In 2016, Papa Owl and Rocket the Dog’s Big Flying Adventure was published, with Helen adding pictures to Michael’s words. After two years, Michael and Helen wanted to develop the idea of Papa Owl further and the inter-generational theme and living on an Island. They wanted to bring to life for children the idea of making things, invention, working together, living with nature and a healthy environment, recycling and local history. Michael had actively brought Wight Aviation Museum (WAM) and Age UK IW Men in Shed’s project together in WAM’s project of rebuilding a replica of the Black Arrow Rocket as a way of celebrating the rich heritage of engineering on the Isle of Wight. So if you put granddads, children, dogs, owls, rockets and Islands together you get Papa Owl goes to Rocket Island. Michael and Helen have also found a place for Appley Tower and Beach in the book as a way to generate future ideas to reopen the Tower for community use. “I believe that culture and cultural industries such as books and films are an essential ingredient in revitalising the local economy and building community spirit. I wanted to create a set of local children’s book characters that bring alive the ideas of generations working together, looking after our environment and celebrating our heritage. The illustrated book tells the story of an inventor called Papa Owl who in this book lives in a Tower by the sea on the fictional Sandy Island. He is called Papa Owl as he lives with two owls and his pet dogs. The star of this story is Michael’s real dog, Muddy, who goes up in a rocket to orbit the earth. 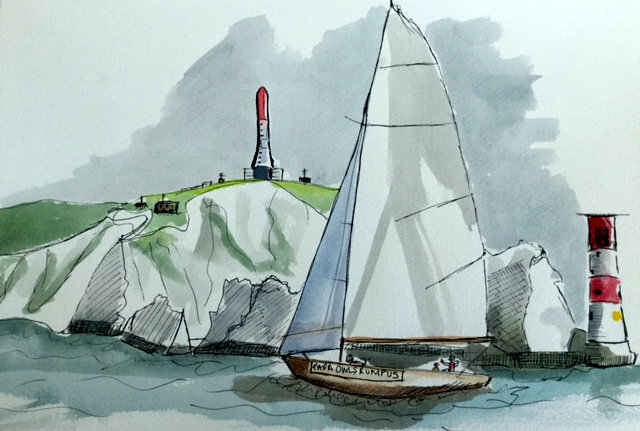 “I had never really drawn anything, but when one of my children sadly died five years ago, I started to draw as a way of grieving and have not stopped. I loved Michael’s story and the way he brings everything around him into the story, stories that have truth behind them. Making Rockets at Northwood House on Sunday, 21st October from 10am. 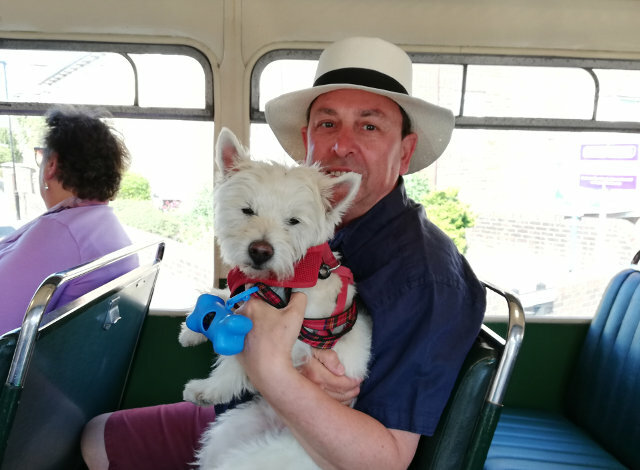 So if you want a family day out making rockets and learning more about Papa Owl, the history of rockets on the Isle of Wight, and meet Muddy the Dog, Helen and Michael go along to Northwood House on Sunday. 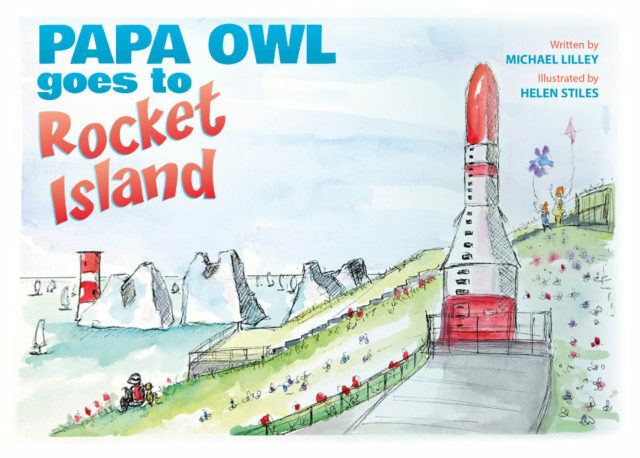 Papa Owl goes to Rocket Island is published as part of the Age UK IW’s Age Friendly Island campaign funded through the BIG Lottery Fund to make children and parents aware of how the older generation has much to offer. It also is a co-production book with Wight Aviation Museum and IW Men in Shed’s project.